See two of Japan's most revered temples, Okunoin and Danjo Garan, on a full-day journey from Osaka. In ancient times, traveling to sacred Mt Koya could take several days on foot. Now you can see these UNESCO World Heritage sites on a day trip by rail, cable car and bus. 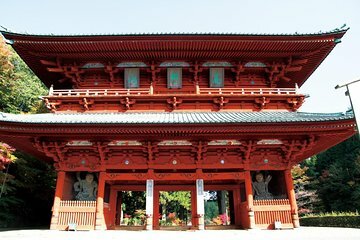 Accompanied by a knowledgeable guide, learn about the famous center of Shingon Buddhism as you walk through Okunoin and Danjo Garan, along with surrounding pagodas, Buddha statues and monuments. Your tour includes lunch, transportation and entrance fees. In the morning, meet your guide at the designated point in Osaka, then relax on the scenic journey to Mt Koya (Koyasan). Mt Koya serves as the spiritual center for the Shingon sect of Buddhism, which Kobo Daishi established in the 9th century in Japan. Start out from Osaka with a 1.5-hour train ride aboard the Nankai Limited Express train. At Gokurakubashi station, your guide takes you on a short cable car ride up the forested mountain. The sacred mountain stands 2,953 feet (900 meters) high with more than 100 Buddhist temples sprinkled on its slopes. From the cable car, a 10-minute bus ride brings you to Ichinohashi Tourist Center where you enjoy a Japanese-style vegetarian lunch. After your meal, walk into Okunion, Japan's largest cemetery. Nestled among towering cedar trees, Okunoin houses the mausoleum of Kobo Daishi, considered sacred to Daishi devotees. A 1.5-mile (2-km) cobblestone path lined with more than 200,000 memorials and monuments leads you to the revered burial site of Daishi. Admire Torodo Hall, where thousands of lanterns illuminate the ancient building. Spend approximately one hour at Okunion, then take a local bus to World Heritage-listed Danjo Garan, which was constructed when Mt Koya was founded. The Buddhist complex contains 20 temples, pagodas and stupas, and your guide takes you to the most prominent structures. See the majestic 160-foot-tall (49-meter) Great Stupa and go inside the Kondo (main hall). Marvel at the elaborate Konpon Daito, a bright red two-tiered pagoda that enshrines the Cosmic Buddha, and an intricate three-dimensional mandala. Have more than one hour to tour Garan with your guide, then return to Osaka's Nankai Namba station via bus, cable car and train. Your tour ends upon your arrival in the early evening. Great day trip. Mayumi was excellent at explaining in detail Mt. Koya's history. She did an excellent job with the logistics of the transportation since we has to take the train, cable car and bus and timing our walk. We were very pleased. Our guide was Kaski and he was just superb. Amazingly we had met him on another Viator tour last year in Kyoto/Nara and he was equally good this time. It was a very small tour so we learnt so much. All his organisation worked like clockwork. A memorable experience. Excellent tour. Great guide Junko. Our guide made the tour...but I also think this tour is a must for anyone who loves a lovely area and history. Vegetarian lunch was really good. Our guide seemed new. She was just a person to get us from Osaka to Mt. Koya on the right mode of transportation. She did not offer any meaningful background or insight to our visit to Okunion or the temples. We actually could have done the trip on our own using a guide book. Secondly, we were only a group of four people on the tour. The other couple had to stop at their lodging to check-in when we arrived at Koyasan. We were not informed of this until we arrived at Koyansan. It did not take much time, but it would have been appreciated if we had been informed. We always felt rushed on this tour. Even with the unexpected extra stop, we finished the tour early. Not very well organized or planned. It was a disappointing day.